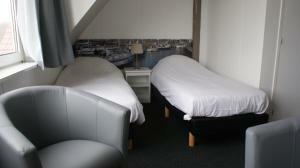 A-HOTEL.com - Luxury and cheap accommodation in Pingjum, Netherlands. Prices and hotel, apartment booking in Pingjum and surrounding. This indicative offer was derived from the most recently booked accommodation in Pingjum and sort by the price, from cheapest Pingjum accommodation to the most expensive hotels. To select accommodation by your preferences we recommend to choose from 4 accommodation offers in Pingjum in total. By entering the dates of your overnight stay in Pingjum and using the filter tools you can sort the best possible accommodation for you. The entered dates of your stay are crucial for the most accurate offer as it derives all the online information on pricing and availability of Pingjum accommodation. Then you can book the selected Pingjum lodging (hotels, apartments etc.) immediately. Featuring accommodation with a terrace, Holiday home t Friese Koetshuis is set in Pingjum. Providing free WiFi, the property also has water sports facilities and barbecue facilities. Set in Pingjum, Farm stay De Welstand 2 offers a fitness centre, a garden and a barbecue. Guests staying at this holiday home have access to free WiFi, a fully equipped kitchen, and a terrace. Set in Pingjum in the Friesland region, Farm stay De Welstand 1 features a terrace. Guests staying at this holiday home have access to a fully equipped kitchen. Boasting accommodation with a terrace, Uniek Friesland is set in Pingjum. Free WiFi is featured. Providing a garden and free WiFi, Herberg de Gekroonde Leeuw offers accommodation in Arum. A continental breakfast is available each morning at the bed and breakfast. Set in Arum in the Friesland region, T Grote Deel has a garden. This apartment offers a terrace as well as free WiFi. Situated in Arum in the Friesland region, De Grup features a garden. This apartment offers a terrace. T Kleine Deel is situated in Arum and offers a garden and a terrace. Guests staying at this apartment have access to free WiFi and a fully equipped kitchen. Het Melkhuis is located in Arum. Featuring free WiFi, the property also has a garden. Het Stolphuis is located in Arum and offers a garden. This holiday home also has free WiFi. B&B De Zeehoeve lies behind the Waddenzee dike, 200 metres from the beach and just outside of the fisherman’s village of Harlingen. The B&B includes a camp site and offers a bicycle rental service to explore the green surroundings. 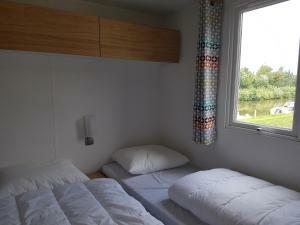 Located in Harlingen, Camping de Zeehoeve provides accommodation with a seating area and a kitchen. Complimentary WiFi is provided. Located in Harlingen in the Friesland region, Camping De Zeehoeve Luxe chalet (2 badkamers) features a terrace and river views. It has a bar, garden views and free WiFi. Camping Sotterum is located in Cornwerd, next to the IJsselmeer. It offers self-catering accommodations with free private parking on site, as well as free WiFi. Bed and Breakfast Oosterpark is situated in the north east part of Harlingen and features rooms with elegant décor, a Dolce Gusto coffee machine and a pair of armchairs. The property has free Wi-Fi and a garden with a terrace. Situated at the north-east edge of Harlingen, B&B De Tobbedanser features a terrace, a garden and spacious rooms. WiFi is offered for free in all areas. Located in Harlingen in the Friesland region, Cosy Harlingen has a terrace. It provides free WiFi and water sports facilities. Situated in Lollum in the Friesland region, Slachtehiem has a terrace. Guests staying at this holiday home have access to a fully equipped kitchen. Cosy Harlingen II is set in Harlingen. This property offers access to free WiFi.